Leading insurance experts - Zurich - appointed Chaos in 2010 to work with both the broker and municipal teams. From segmentation and sectorisation projects, internal comms and event support through to marketing and corporate communications - Chaos have supported Zurich in a number of ways. 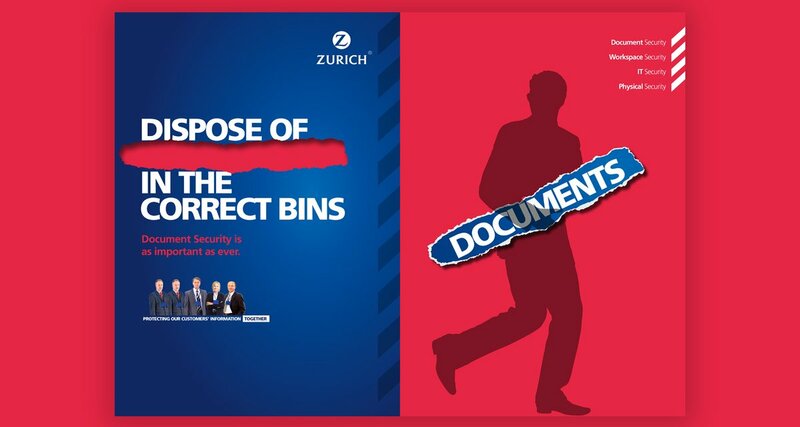 Zurich asked us to create an attention-grabbing campaign to communicate and reinforce the vital security precautions their staff should be taking day-to-day. We delivered an ambient poster campaign in high-visibility areas. A key word from each headline was then ‘ripped’ out. These words appeared elsewhere on the creative, but in the arms of a human shadow to create the ‘theft effect’. As part of their CSR strategy to make environmental savings, Zurich needed to remind staff of their green responsibilities (without wasting lots of paper or carbon!). We decided to tell them in all the right places – with our Little green reminder campaign. By placing green stickers in key energy use areas, with fun messages about power saving, we took the campaign to all the trigger areas. Reminding users that small changes can make a big difference to our planet, we helped Zurich hit their green goals. Zurich UK asked us how to best promote their risk expertise to brokers and customers in their Corporate sector (£5-£300 million companies). 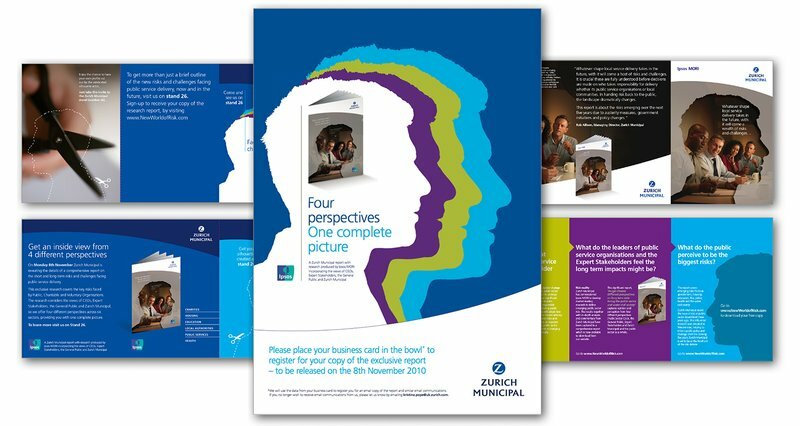 By unravelling a complex brief and pushing the corporate guidelines, we developed a clear umbrella proposition (The Value of Insight) supported by stunning x-ray visuals to demonstrate the benefit of Zurich, looking more deeply into risk. Integrated online and offline across multiple broker and customer channels, the campaign really boosted business. Zurich Municipal is the division that directly insures Government, Charitable and Voluntary organisation across the UK. As a content marketing initiative they commissioned an industry insight report by IPSOS which incorporated the views of four key audiences – CEO’s, Expert stakeholders, the General Public and Zurich Municipal. To launch this content and maximise its engagement and such an investment, Chaos were asked to create a multi-channel marketing campaign. ‘Four perspectives. 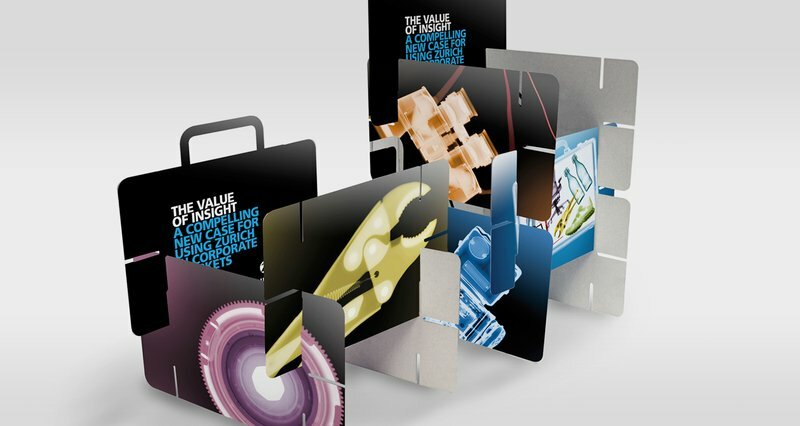 One complete picture’ became the messaging proposition and graphically we brought this to life by designing innovative mailers, invites, supporting literature and event graphics.